The Psychedelic Furs are an English rock band founded in London in February 1977. 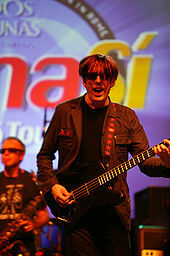 Led by singer Richard Butler and his brother Tim Butler on bass guitar, the Psychedelic Furs are one of the many acts spawned from the British post-punk scene. Their music went through several phases, from an initially austere art rock sound, later touching on new wave and hard rock. The band scored several hits in their early career, but were launched to international attention in 1986 when the film director John Hughes used their song "Pretty in Pink" for his movie of the same name. The band went on hiatus after they finished touring in 1992, but later regrouped in 2000 and continue to perform around the world. According to Richard Butler, the Psychedelic Furs began rehearsing in the Butlers' front room, but were soon banished because of the noise. They became prominent in England's emerging punk scene in 1977, where they auditioned for Essex Kennedy's record label Manfactory Wave Punk. Kennedy signed the band, hoping to cash in on the punk scene that was sweeping the UK and believing that a more produced studio sound would appeal to a larger market. The band was initially called 'RKO', then 'Radio'. They vacillated between calling themselves "The Europeans" and "The Psychedelic Furs", playing gigs under both names before permanently settling on the latter name. The band initially consisted of Richard Butler (vocals), Tim Butler (bass guitar), Duncan Kilburn (saxophone), Paul Wilson (drums) and Roger Morris (guitars). By 1979, this line-up had expanded to a sextet with Vince Ely replacing Wilson on drums and John Ashton being added on guitar. The Psychedelic Furs' debut, a self-titled album from 1980, was produced by Steve Lillywhite. The LP quickly established the band on radio in Europe and was a No. 18 hit in the UK Albums Chart. The album also found success in Germany, Italy, France, Spain and Australia. The US version of the album was re-sequenced, but failed to have a strong commercial impact. The Furs did find success in the US with their next release, 1981's Talk Talk Talk, which saw the band making its debut on the US Billboard 200 chart. In the UK, the album spun off two charting singles, "Dumb Waiters" and the original version of "Pretty in Pink". The latter song served as inspiration for the 1986 John Hughes film of the same name, and was re-recorded for the platinum-selling soundtrack - though Richard Butler remains adamant that the cinematic interpretation had very little to do with the song's original intent. Ely left the band after Forever Now, though he would return for the 1988 single "All That Money Wants" and the 1989 album Book of Days. Phill Calvert played drums on their subsequent tour, but left before the recording of The Furs' 1984 release Mirror Moves. Mirror Moves was produced by Keith Forsey (who also programmed the drums and became the band's drummer), and featured the songs "The Ghost in You" and "Heaven". Both charted in the UK, and "Heaven" became the band's highest charting UK hit at the time, peaking at No. 29. Columbia Records opted for "Here Come Cowboys" for the corresponding US release but it failed to chart, but "The Ghost In You" was a hit on the Billboard Hot 100. In Canada, "The Ghost In You" also charted and Toronto's new wave radio station CFNY listed the parent album Mirror Moves as the No. 1 LP of 1984. Mirror Moves became a Top 20 album on the Canadian LP chart. By the mid-1980s, the band had become a staple on both US college and modern rock radio stations. Simultaneously, they were experiencing consistent mainstream success, placing several singles in the charts on both sides of the Atlantic. Still, according to biographer Dave Thompson, they would "have more impact on future musicians than they ever did in the marketplace". In 1986, the band recorded a new version of "Pretty in Pink" for the soundtrack of the film of the same name. Released as a single, it became their biggest hit to that time in the US, and their biggest UK hit. Butler later claimed that the success of "Pretty in Pink" caused the band to be pressured into entering the recording studio to record a follow-up release before they were ready. The result was Midnight to Midnight, their biggest Top 40 success to date, but an album Richard Butler later characterized as "hollow, vapid and weak". A more overtly commercial effort than the Furs had ever recorded before, the album also featured the single "Heartbreak Beat", which proved to be the Furs' biggest Top 40 entry in the US at that time. The album also featured drummer Paul Garisto and saxophonist Mars Williams, both of whom continue to tour with the band. In the wake of Midnight To Midnight, the Furs issued "All That Money Wants", a 1988 track recorded for a best-of compilation album All of This and Nothing. 1989's Book of Days also saw a return of Ely, while 1991's World Outside was their final commercial release. From 1988 on, The Furs' singles had steady chart success with three No. 1 hits on the newly established US Modern Rock chart between 1988 and 1991. "All That Money Wants" was a No. 1 hit in 1988, while "House" topped the chart in 1990, and "Until She Comes" was No. 1 in 1991. The band went on extended hiatus in the early 1990s, with Richard and Tim Butler going on to found Love Spit Love with Richard Fortus and Frank Ferrer (both of whom would later join Guns N' Roses). In 2000, Richard Butler, Tim Butler, and John Ashton re-formed the Psychedelic Furs. The touring lineup also included Richard Fortus and later, Frank Ferrer. They released a live album Beautiful Chaos: Greatest Hits Live, which included a new studio recording, "Alive (For Once In My Lifetime)." A DVD version of the performance included live versions of "Alive" and three other previously unreleased songs: "Anodyne (Better Days)", "Cigarette" and "Wrong Train." In 2006, lead singer Richard Butler released an eponymous solo album, Richard Butler. Since reforming in 2001, the band continues to tour around the world. The current Psychedelic Furs touring line-up is Richard Butler, Tim Butler, Paul Garisto, Mars Williams, Amanda Kramer and Rich Good. ^ a b c d e f g h i Strong, Martin C. (2000). The Great Rock Discography (5th ed.). Edinburgh: Mojo Books. p. 779. ISBN 1-84195-017-3. ^ Armstrong, Gene (30 May 2013). "Love Their Way: The Psychedelic Furs will take the Rialto stage providing a look back on college rock memories". Retrieved 19 March 2016. ^ Darling, John (2000). What's in a Name? : The Book of Bands. Xlibris Corporation. ISBN 0-595-09629-8. ^ Ogg, Alex (20 Oct 2010). "All Of This And Nothing: The Psychedelic Furs on 'Talk Talk Talk'". The Quietus. Retrieved 10 May 2011. ^ Thompson, Dave (2004). Beautiful Chaos. Helter Skelter Publishing. ISBN 1-900924-47-1. ^ a b "From forever to a cosmic joke". Sydney Morning Herald. 19 June 2006. Retrieved 12 September 2015. ^ Ruhlmann, William. "The Psychedelic Furs biography". AllMusic. Retrieved 19 March 2016. ^ Monger, James Christopher. "Richard Butler Biography". AllMusic. Retrieved 19 March 2016.